A clinical display saw Spurs beat United by 2-0. 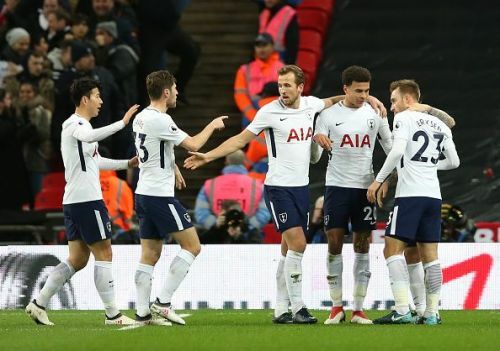 Tottenham Hotspur secured an impressive 2-0 win over Manchester United in Wednesday's high-profile clash. The hosts got off to a perfect start when Christian Eriksen slotted past David De Gea in the first minute. United enjoyed a decent spell after going behind but saw themselves trailing by two goals after Phil Jones scored an own goal in the 28th minute. The second half was a stroll in the park for Tottenham as they had already inflicted enough damage during the first half. The victory saw Spurs placed within touching distance of the Top 4 whereas defeat for United saw City extend their lead at the top of the table to 15 points after the latter achieved a convincing 3-0 win against West Brom. Lloris was not tested for most parts of the game but made some smart saves while called upon. The result saw Lloris notch up his ninth clean sheet of the season. The right-back threatened United's defence while going forward and was resolute at the back. 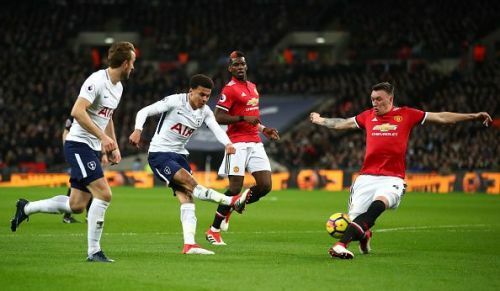 Trippier made a number of vital blocks to keep the likes of Alexis Sanchez in check and also fired in a low cross which led to Spurs doubling their lead as Phil Jones put the ball into his own net. Sanchez performed his task to perfection and kept the likes of Lingard and Lukaku quiet throughout the game. The youngster was composed at the back which resulted in him earning a well deserved clean sheet. The Belgian kept things solid at the back with some well-timed tackles and interceptions. Vertonghen put his experience to great use and saw off any danger from United's front four. Davies had an excellent outing as he prevented Martial from causing any damage from the left. The youngster linked up seamlessly with the likes of Dele Alli and Christian Eriksen while going forward. Along with Dembele, Dier held his team's midfield shape and made a number of important interceptions. He used his impressive positioning skills and did not allow United's forwards to create an impact on the game as his efforts saw his side win the all-important midfield battle, which ultimately helped Spurs secure all three points. The Belgian provided the perfect link between defence and attack, keeping things ticking after regaining possession. Dembele formed a solid partnership with Dier in the middle of the park, thereby helping his side secure the win. Alli used his skills to trouble United's defence on a number of occasions. The English international linked up seamlessly with his side's attack and will be slightly disappointed for not getting onto the scoresheet. It just took eleven seconds for the Danish international to give his side the lead. 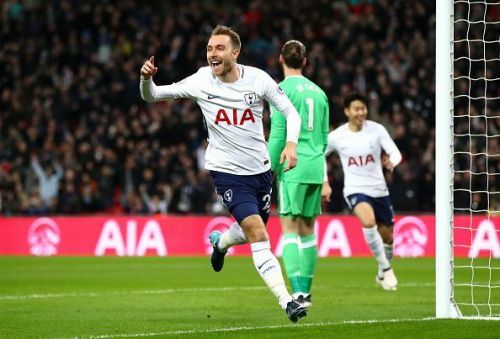 Eriksen orchestrated a number of breathtaking attacking moves, constantly troubling United's defence with his vision and impeccable passing range. Son worked hard throughout the game and constantly made some menacing runs behind United's defence. The only drawback in his performance was some of his decision making in the final third. Kane played an important role during the buildup to the first goal after winning an aerial duel against Phil Jones. The striker led the forward line brilliantly and would be slightly disappointed at not increasing his goals tally for the season. Lamela replaced Son in the 80th minute, linking up well with his fellow forwards to keep the pressure on the opposition's defence till the very end. Sissoko was introduced in the 87th minute and helped his side see out the game. Wanyama was thrown in during the dying seconds and had no time to make an impact.